Naturasil for Dog Warts is proven to eliminate all strains of dog warts common to dogs without the pain, scarring, or harsh treatments found in many traditional methods used by veterinarians. Naturasil uses only the most exclusive plant extracts available worldwide to provide you and your pet with a phenomenal products. The topical application of these extracts are lipophilic and absorb into the dog's skin as soon as they are applied. Apply to wart with cap brush 3 times daily for 2-6 weeks until wart has cleared. Some pets may be sensitive to essential oils. Skin test for tolerability. If irritation or reaction occurs, discontinue use. I want to let everyone know this works. The bigger the wart the longer it takes but it works. I have used this on my boston terrier for 3 warts. They where years apart and I still used the same bottle. Vet wanted over $300 to remove just one. Money well spent. Thankful to find an All Natural Product safe to use on my pet! This product worked great. Just had to apply 3x a day to the wart site. After about 2 weeks it started to flake away. You may want to use a collar to prevent licking. My rat terrier Jonah had several large warts near his tail. This product worked wonders to get rid of his warts pretty quickly. They just flaked off after several baths with using it every day for a couple of weeks. Thank you Naturasil. Just had to write and tell you how happy I am with your dog warts product. My dog had warts on his ear and the doctor wanted to burn them off. I used this for a week and they slowly started to disappear. Thank you! while working on some of the warts, it dose not seem to touch some of the bigger one's. I am hoping in time will do something for the rest of them. It has only been 3-4 weeks, so need to give more time. The smell is strong and does seem to bother my dog. other than that I am incline to keep using it. What a miracle! Thank you! 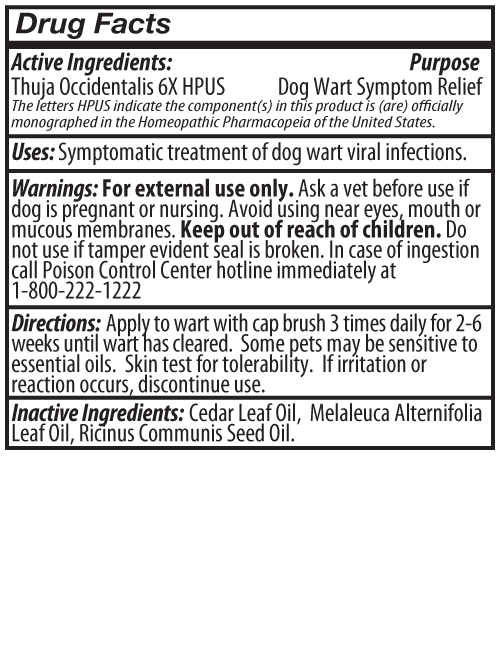 The Naturasil dog wart medicine is awesome! Our vet wanted to charge us $610.00 to remove the wart vs. the $50.00 we spent to remove the wart. It's gone and our dog is smiling again. Not to mention it was painless for him, which is why we looked into the product in the first place. 3x per day and within a few weeks it is completely gone. The first-stages is really gross and didn't know if it was working but then it just dried up and fell off. Yeah! We've already recommended your site to all our friends with pets. At first I was skeptical about this product because I couldn't find it in any of the large pet stores, but it did work. It made the wart bleed once which can get messy so it doesn't work "as advertised."